XFINITY is kicking off an exciting new program, and I am happy to be a part of their blogger program. Over the next six months, I will be showing you ways that the new XFINITY X1 platform can enhance your life and save your family time. Look forward to fun features and giveaways! This is a compensated program, but all opinions will be my own. I had the pleasure of attending an event in the city recently to see firsthand what the XFINITY X1 platform is all about. Not only was it a pleasure to get to know the team, but I was beyond excited and impressed with this new platform. I seriously cannot wait to get my hands on it. Fall TV shows are piling up, and we have officially kicked off our marathon-show-watching season in this house! The new X1 platform has so many impressive features. Normally you expect a little tweak here and there with your cable service, but XFINITY did not mess around with this. The changes are intense, packed with useful and time-saving upgrades that will please even the biggest TV fans. We are talking about more space and an intuitive, smart device that gets to know what you like. I will go into detail about everything throughout the six month period. For now, I just cannot wait until my system arrives. After seeing everything myself, I know we are going to love it. Did I mention that it’s fast? Yes, hence the name “The Fast Life with Ty”. XFINITY knows that speed is essential in our busy lives and wanted the face to match that message. 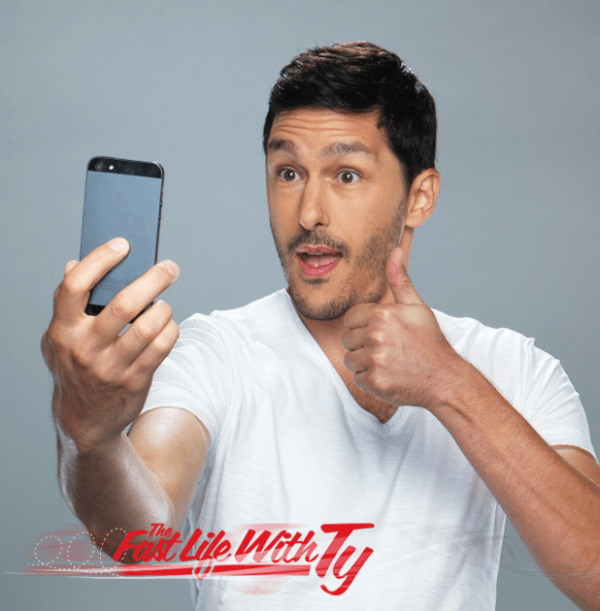 Ty is their new energetic ambassador eager to help you find the best shortcuts and life hacks in Chicago. Living the life style with these tips to help you. He has a ton of energy and keeps things interesting. I think it’s great that Ty represents the need to keep things going quickly when we live a life where every second counts. I to like Ty need to have a fast internet. I have Comcast too and it has been great so far. I have a fast lifestyle and need fast internet too! I think it’s going to be interesting to see what Ty is up to every day. He seems to jump around pretty fast. I like the techniques and tips ty shared. Lots of interesting ones and they are useful. Ty’s site is pretty neat. with today’s lifestyles of being on the go and often busy, I can see how Ty can relate to many of us. I love watching chefs – especially because they can do things so fast, so I’m keen to learn! I love the post 25 mind-blowing food prep techniques to save you time & frustration!!! I like Ty’s energy and need for speed. I think the show will do pretty well.. at least with the female audience..
LOL Steven!! It’s not a show, though. Just their new face to go with their new program! Okay, I visited. Is this a site to speed up your tweeter? Looks like an easy to use platform. I have Comcast and should look into using it. Looks interesting to see what life with TY will do next. Love the fast lifestyle, as I have one! I think comcast is just desperate . They are losing customers by the boatloads. I switched to Fios from time warner cable and never been happier. That’s a cute site with Ty’s obvious energy and passion; it’s a good way to promote this product I’d say. I love how easy this is and how you can see everything you’re supposed to be doing. I Love how fast my Comcast internet is! I like the tips Ty gives too! Ty has it right – speed is awesome. Xfinity is the only good internet in our area. So I’m so excited to see about the new announcements and fun things they have going on! This sounds like a really helpful thing to keep up with all of our busy lifestyles. I love creative hacks and time-saving tips, and Ty is a pretty likable, congenial host, so I love it! TY Helps you keep your internet fast! I love Ty and his sweet personality. He’s upbeat and positive. We need more people like that in the world! I like all the social media and I like it to be speedy. Ty seems like a knowledgeable host, so I love it! I for sure like FAST!! I am a Xfinity customer and am so excited about this. With today’s world, a speedy interent is a must. Sounds like Comcast is on the ball. Thank you! I love the tips! It’s so fast and easy! The new X1 platform looks awesome! I can’t wait to try it. i dont have comcast but i have always heard great things about it. faster is better in today’s high tech world! Unfortunately we don’t have comcast in our area, I so wish we did! Wow! I was surprised by the variety of content — lots of time saving ideas! Just what I need. I enjoyed reading this blog and learning about Xfinity, thank you. I LOVE HOW TY WORDED THIS “Because when you live life fast, every second counts” VERY TRUE! THANKS FOR THE CHANCE! He brings the high speed and energy to the brand that Comcast offers me. I use their service for my internet and it works well. I learned that Comcast provides a fast service!I have Comcast and they gave me an awesome deal on faster high speed internet with more TV choices. Xfinity is the way to go! I have a need for speed especially on the internet. I also like fast service. I like the tips he shared & I’m really interested in seeing his show! I learned how it provides speed. I honestly don’t really understand the site? Who is Ty? Should I recognize him for something? I also didn’t understand his advice (underwear rolling…..?) It is also a bit weird that it is city specific and didn’t include my city (DC). I need speed my internet is horrible here. I really like Ty. I love how fast he is. I like the he posts good times to book flights. We have had Comcast internet for several years now and it’s great. I work from home and I’ve never had any problems with it. Oh it looks wonderful!! I have been with a different company…for about 20 years now. I am not really happy with my service, but have been so nervous to change. I would love to try Comcast and switch over and follow Ty!! The tips on the page are interesting, and fun. I really need to speed things up. I learned that it provides you with what you need for your lifestyle – which is speed. I learned that it has great speed and I need that in my life! I don’t mind Comcast for cable and the new HD box and DVR look like an improvement but they have the worst customer service and it hasn’t changed in 25 years! maybe i need to switch, i need fast internet! Gives awesome tips for me to use. This looks really awesome, can’t wait to try it out! We all live such fast paced lives and its great that Ty not only relates, but offers advice and great tips! I had never heard this before “Give your phone a volume boost by dropping it into an empty cup.” Great tips. I’ve had Comcast for years and have always been pretty pleased with their service. I like how Ty has all of his social media in one place. That’s very convenient. I never realized the dollar bill is 6 inches or though about using it to measure my 6-inch sub. He is certainly high energy and the fast life was interesting. Ty’s the king of speed, he says. Love his tips! I had no idea to put a cup of water next to pizza in a microwave to avoid chewy crust! Not sure if moving fast all the time is something we should emulate. I have never seen this man before but he is nice looking. But why can’t he slow down a bit? I’m glad ty has speed. I don’t understand the page though. Is Xfinity trying to have a G+ or FB platform, too? I doubt it can compete. His site doesn’t make much sense to me. I don’t know what his point of view is or what he has to say. He just says he’s fast. I don’t care. I loved all of the tips and tricks Ty shared. Will be checking again. This is a pretty interesting concept and Ty isn’t too hard on the eyes, either. Lol! He’s speedy and posts to half a dozen different sites. More than I want to follow. I like the tip about using duct tape to open us an old stuck bottle cap. I will definitely try this. i learned that yesterday was national desert day! i have a major sweet tooth though and i participated without even knowing it :). That is a really great website. I like Ty. Would love to have faster internet. I enjoyed reading about Ty’s adventures and his wonderful service from Comcast. Faster isn’t always better…well with internet it definitely is! I like how Ty has speed. Lve the atl section. We spent 5 wks there before our fourth baby was born. I like TY love fast internet, like many people these days I am impatient. I like the Ty’s speed and energy. But it makes me a little tired just thinking about trying to live life that fast. Looks great! I need speed! I have Comcast and should look into using it. i love how fast it is. i love speedy things. i hate to wait! The King of Speed and his name is Ty.. Thank YOU and thank Ty too. I like the Vine videos. They are a lot of fun! I definitely would love to save some time with speedy internet! Could I just have Ty?? Thank you for the chance!!! Although…. really please send TY!!! It is a nice change and overall look that helps the image a bit. I love the angle they are taking with the Fast Life with Ty. Ty’s Post are very informative. I learned a few new things. Ty loves to go fast fast fast and I think he is adorable. His internet provider is Comcast and he loves it because it goes fast too. This website looks very interesting. Thanks for sharing!